Discover our superb Water Park with water slides and games in La Londe-les-Maures, a stone’s throw from Porquerolles, in the Bay of Hyères, near Le Lavandou and Bormes-les-Mimosas. 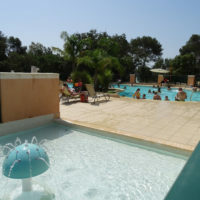 The only campsite water park of its kind in the Var, South of France, by the Med! Our 1300m² water park is set next to our large, heated outdoor pool and fun paddling pool! Two magnificent water slides with a total of 4 lanes: 3 straight lanes and 1 looping lane for guaranteed thrills and spills! 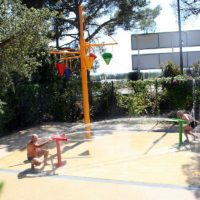 A water games area for all the family: children, teenagers and adults. Get ready for some great laughs! Fountain for tiny tots in the heated paddling pool in the main pool area! The only water park open to reduced-mobility guests: in addition to the heated pool, our water games are entirely accessible to reduced-mobility guests (fitted with a bathing chair). Your four-star campsite has just given its “Mitan” sanitary block a facelift! Now featuring shower and sink cabins, family showers and a nursery. Two family showers on men’s side and women’s side with sink, bench and two showers! Plus two cabins for reduced-mobility guests as before! Enjoy your holiday at our four-star campsite! And happy games at the water park!